In Algebra II,, we’ve recently been delving into quadratics. I recently blogged about how I taught completing the square and the quadratic formula, and put up a bunch of resources. 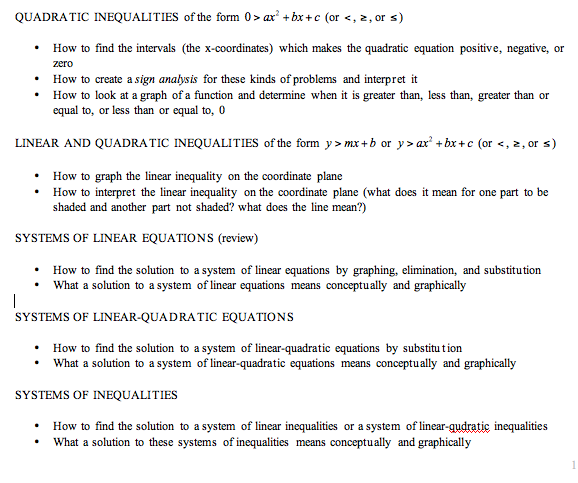 Since then, we’ve moved on to graphing quadratics, followed by inequalities. I’ve been trying something new, which is creating packets for students to work on. In essence, I’m creating my own textbook for these sorts of questions. I thought I’d share them with you in case they prove useful . I’m pretty proud of them — and they way they fit together and build up understanding, not just providing a method to solving problems. Hopefully they’ll be useful to someone else out there! The formatting might be a bit off for you… It looks slightly off (meaning the pages don’t end where I intended them to end) on my mac but fine on my PC. I think you need to make sure that on a Mac you select all and convert the font to “Gill Sans” (on a PC, I think it’s called “Gill Sans MT”, which is creating the problem). UPDATE: PDFs posted, without typographic weirdnesses. Wow! I’ve skimmed through some of these and I have to say I like it. That is, I like it from mathematical point of view – not the typographical… I tried to open them in my OpenOffice.org under Ubuntu and some of the inequality signs just didn’t show up… Could you possibly upload also a pdf? And one thing I couldn’t understand: your number lines have arrows at both sides. Do you draw them this way in the US? Here in Poland we draw an arrow only at the right side, which makes sense – the arrow shows the direction of increasing numbers. @mbork: Thanks for your support! I tried opening one of them and some of the inequality signs didn’t show up on my mac either. I’ll try to post the PDF versions today. As for ConTeXt, it looks like a fancy LaTeX editor! I’m excited to download it and play around with it! In the US, number lines always have arrows on both sides — to show that the number line continues in both directions (increasing and decreasing numbers). It is understood here that the right direction is the direction of increasing numbers. As for ConTeXt: not really (well, there seems to exist a similarly named editor, but that’s not what I mean). It is a big TeX macropackage, to some extent similar to LaTeX, but much more modern and really, really interesting (and probably easier to use than LaTeX). You may want to look at http://wiki.contextgarden.net to learn more about it. @mbork and all: PDFs are now posted – and they don’t have any typographical issues! Yay! Thanks for the multiple versions. I’m not sure how much I’ll use when, but I’ll let you know. I really like these, and I’m going to use them. Thanks, once again, for sharing such excellent stuff.